California State Fair, July 12th – 29th, this eighteen-day fair is a robust celebration of the State of California, its industries, agriculture and diversity of its people. This summer the State Fair is all about “Fun that Moves You”. This catchy theme is sure to inspire the young and young at heart to come out for BIG FUN! If you think you have the dance moves just wait until you see our beloved mascot Poppy! The Cal Expo fairgrounds come alive every summer as the California State Fair becomes a city within a city that hosts nearly one million visitors. Folks come from near and far for the memorable delights of this extravaganza that includes exciting exhibits, amazing attractions, live entertainment, and the Magnificent Midway. 110,000 attendees expected. Find out what is going on; Concerts, Entertainment, Contests & Competitions, Attractions & Exhibits, Horse Racing. Stanislaus County Fair starts on July 13th and goes through July 22nd. In addition to awarding more than 30,000 ribbons each year, the Stanislaus County Fair IS an award-winning fair itself. More than 220,000 visitors will pass through our turnstiles for award-winning fun at the largest family-centered event in Stanislaus County. Stroll through our tree-shaded grounds, or enjoy the sounds of Kellie Pickler, Bret Michaels, LeAnn Rimes, Uncle Kracker, Foreigner, and so many more coming our way. Presale tickets start at $5.00 for children with a season pass available for $75.00. Located at 900 N. Broadway, Turlock. Madera District Fair is just around the corner, September 6th – 9th. This year we connect with the “roots” of our community and celebrate Madera’s connection to the forest with “Party Down In Lumber Town!” The Madera District Fair recently broke ground on this amazing project which will house a water wheel, steam donkey, saw mill, and a number of historical artifacts from our community. Concert Tickets On Sale NOW!. Visit our concert page for more information on this year’s amazing lineup which included Tower of Power on Thursday Sept 6th, STYX on Friday Sept 7th,Rodney Atkins on Saturday Sept 8th, and Lupipllo Rivera on Sunday Sept 9th. Solano County Fair, August 1st – 5th. “Home Sweet Home” will be the guiding theme for this year’s fair, and the focus will be on all the elements that make our home county great – its people, talents, communities and cultures – while shining a spotlight on the great “sweets” to be found at the Fair. “Building on last year’s showcase of our home communities through attractions like the County & Cities Expo and the International Pavilion, we are excited about continuing to celebrate everything that makes Solano County and our Fair special” stated Fair General Manager, Mike Paluszak. “This year’s theme allows us to do that in a fun and somewhat whimsical way by featuring one of the most popular reasons for attending the Fair – the food!” The Solano County Fair will continue its tradition of providing the best summer entertainment value in the area with five nights of headline concert entertainment included FREE with the price of admission during the 2012 Solano County Fair, August 1-5. Just announced forThursday, August 2 is country powerhouse, Heidi Newfield, followed by soul superstars, Tower of Power, on Friday, August 3. Additional acts for Wednesday, August 1, Saturday, August 4 and Sunday, August 5 will be announced soon. 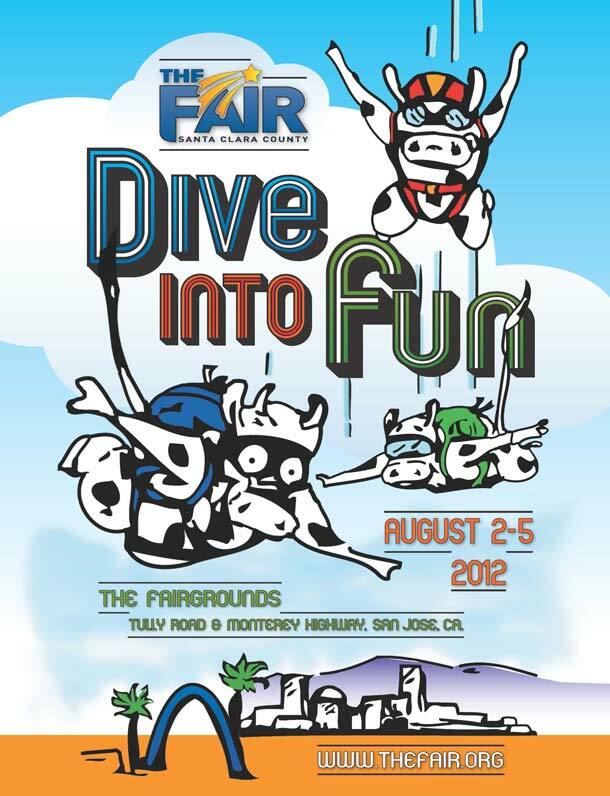 Santa Clara County Fair, August 2nd – 5th, a County Fair with animals, entertainment, fair food, rides and all the rest. New this year is the Santa Clara County Americana Art & Crafts Show. Three day juried show open to artisans who feature handmade arts and crafts. Another new feature – Amateur Wine competition – Home winemakers are invited to bring their wines to the Fairgrounds, where an impartial panel of experts will judge them. On Saturday, August 4th a Demolition Derby is scheduled and 30,000 attendees expected. Some years, local square dance clubs have participated in “Dancing at the Fair” by dancing there on their regular club night. For 2012, just one session of square dancing has been scheduled for August 3rd, 7-9pm. Located at Tully Road and Monterey Highway in San Jose, CA. Tuolumne County Fair, July 12th – 15th, “The Hottest Little Fair in California is a Gold Country Keepsake” The Mother Lode Fair is located in the beautiful foothill town of Sonora on historic State Route 49. The Fair began in 1889 as the Tuolumne County Fair & Horse Show, then reinvented itself in 1938 as the Mother Lode Fair. The Fair today is situated on 25 acres, edged with lawns and bordered with a year-round creek. Two hundred trees add scenic value to this garden setting, making the fairgrounds an event destination to an estimated 274,000 visitors throughout the year. This years entertainment includes; The Joe Craven Trio, the Good Luck Thrift Store Outfit, the Lost Weekend and many more.